When any of our clients enter our center for a hair transplant, they can expect only the best care in town. Our highly trained staff and technicians will accommodate your needs in a sensitive, yet masterful way. 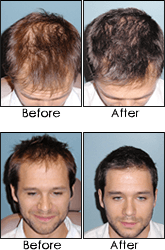 Our hair transplant procedures are performed as an outpatient procedure. Remember, we are AAAHC certified, meaning that our center has the highest qualifications and certification in the Tri-State area. The FUG procedure itself is simple. A thin strip of hair is surgically removed from the back of your head. Next, your hair follicles are divided using binocular dissection. Thousands of individual hairs are then transplanted onto the scalp in the areas where hair is needed. This procedure is done using localized anesthesia- you can talk, sleep, or even watch the Cincinnati Reds or Cincinnati Bengals game during the entire operation! We also offer Follicular Unit Extraction. The FUE procedure is an alternative technique for patients who are looking for an option other than the traditional FUG procedure. If you are concerned about having a linear scar, if you want to wear your hair short, or if your scalp is too tight for strip harvesting, then FUE is the procedure for you. Give us a call today to learn more! After the smooth, effortless procedure at our comfortable Cincinnati location, you’ll experience very little pain. Any discomfort will be easily handled with medication and should dissipate within one to two weeks. Although you’ll have to rest and sleep with your head elevated for a few days, you can rest easy knowing that you have experienced a procedure that will change your look for years! You’ll begin to really notice hair regrowth in three to six months, however your hair will continue to improve for up to one year, but the best part is that your results are permanent!